At the start of the first novel Father Peregrine is appointed Abbot, at the age of 45. Father Peregrine, whose name in religion is Columba, is an arrogant, impatient man, a hawk trying hard to be a dove, whose struggles to manifest the character he considers to be expected of an abbot provide much of the narrative. He is surrounded by a company of flawed, human monks who are - for the most part - also serious about their calling, and who - again for the most part - come to love their driven and hard-driving leader. They lived six centuries ago, yet their struggles are our own--finding our niche; coping with failure; living with impossible people; and discovering that we are the impossible ones. 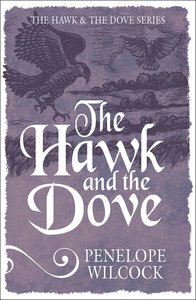 About "The Hawk and the Dove (#01 in The Hawk And The Dove Series)"
Pen Wilcock is the author of a number of novels, including The Hawk and the Dove trilogy (Crossway) and The Clear Light of Day (Monarch / David C Cook) and various other books including the classic Spiritual Care of Dying and Bereaved People (soon to be reissued by Lion). She has many years of experience as a Methodist minister and has worked as a hospice and school chaplain. She has five adult daughters and lives in Hastings, UK.